"I created this painting as a conservation piece. The survival of his kind hangs in the balance – sadly the Black Rhino has now been lost to us. 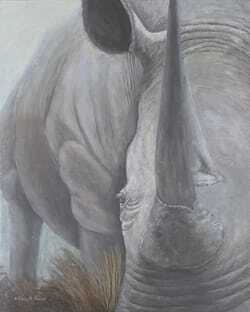 The White Rhino is truly facing the fight of its life as poachers of Rhino horn are a constant and unrelenting threat. I have chosen to heavily crop the image of this male, so that the focus of the painting is it’s horn and the look of sadness in its eye."